Before the expansion of taquerías there was Milagro Cantina, one of the first Mexican restaurants that deviated from tex mex in Toronto. At Milagro, jalapeno laced cheese isn’t sprinkled liberally on top everything, but rather flavours are added with smoked peppers, creamy avocados and freshly made salsas. It’s my go-to location for tacos and burritos, since I can make reservations, am not required to share a table with strangers and actually get plates and cutlery to go with the meal. Having visited all three locations, my favourite is the uptown Yonge site (pictured in this post. Update: this location has since closed) but each has their own appeal. The Mercer location is by far the largest and best for large parties and its proximity to the entertainment district. Meanwhile, Queen West is intimate and quieter so good for casual meals where conversation is key. The Yonge location is the happy medium – still fairly large (with two floors) and a nice vibe (bustling bar but not so loud that you can’t carry a conversation). At all the restaurants, complementary house made tortilla chips and salsa is handed out after ordering. 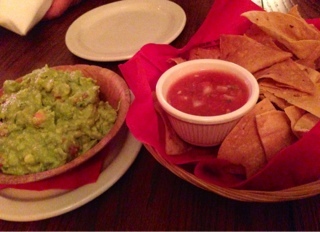 Although delicious, the salsa is rather small and never enough to last past 10 chips, so we added on an order of guacamole ($11.50 for large) to satisfy ourselves (so much so that we had to get a refill of chips). The guacamole is simple with the tomatoes and onion, muted so that the fresh creamy avocado shines through with some salt and citrus. A bit of serrano peppers is scattered throughout but sparingly so there isn’t much heat. On this visit I’ve decided to finally try their ceviche; with five to choose from and two sizes each, we ordered the snapper ($15 for large) to share. It’s too acidic for my taste and all you can taste is lime, lime and more lime - perhaps, if they strained the mixture out of the liquid rather than serving the ceviche in it the citruses’ can be calmed. Additionally, if there was more mango the sweetness could have better counteracted the pungent lime. The dish does have a nice heat to it with more of the serrano peppers. Certainly, it was nicely presented in an oversized ice cream container – although it’s a bit messy to spoon out for the first person. 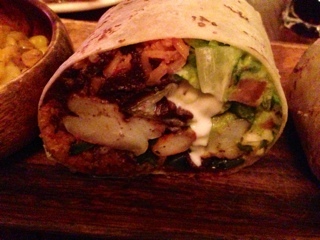 Milagro’s camarones burrito ($14) is the one dish I’ve ordered on multiple occasions and is my favourite burrito. Having eaten it at both the Yonge and Queen West locations, they were both delicious but at the Yonge location has more heat and seems saucier. It’s a substantial meal with the well toasted tortilla shell jam packed with ingredients – aside from several large grilled shrimp, there’s also thick black refried beans, flavourful rice, smoky roasted peppers, guacamole, chipotle-may, jalapenos, onion and cilantro. On the side is some spicy warm corn (at Yonge) and more rice (at Queen West). What makes this burrito my favourite, other than the fresh ingredients, is that the shell is so nicely grilled adding a toasty crunch to it. Also, the burrito has sauce but not so much liquid that it becomes a huge mess to eat. So, if you generally like super moist burritos, this wouldn’t be the one for you; the beans and guacamole are much thicker and there’s no sour cream or blended jalapeno sauce adding unnecessary liquid to it. 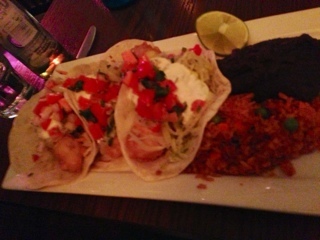 My husband ordered the tacos le perla ($18 for the entrée version). The battered snapper wasn’t really crispy so being deep fried didn’t matter, so I’d prefer it just be grilled so that it’s healthier. But, the fish was fresh and topped with a lot of great ingredients including a sweet tropical slaw (could be pineapple?) and chile crema that contrasts it with a spicy finish. In the past, I’ve tried other tacos and find the capital ($11, ribeye steak, cilantro and salsa verde) and rosarito ($12, shrimp, refried beans, crema and avacado) were both wonderful. In terms of mains, the pescado Rodrigo ($21) is good if you want something lighter as it’s a simple piece of pan seared snapper with zucchini and topped with olive oil, lime and cilantro. Regardless, I’ve eaten at this chain five times and have loved it more each time. Milagros is the place I head to when I need a Mexican fix, and it’s nice to know you don’t have to wait forever to be satisfied.